Last Friday afternoon was the first time I'd been to Cape Henlopen State Park since mom and I climbed the World War II Observation Tower in early spring. 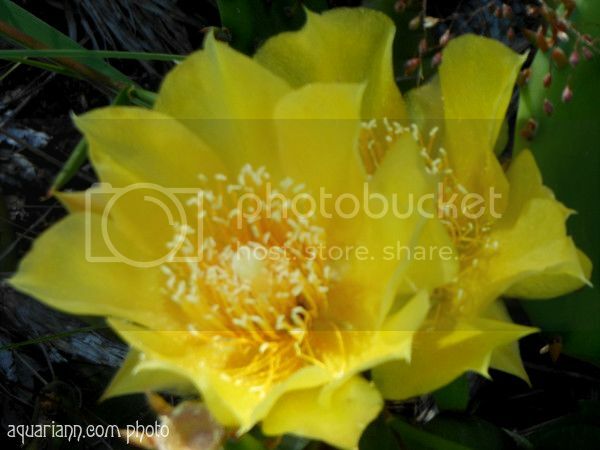 The prickly pear cacti are celebrating the start of summer by blooming with gorgeous yellow flowers! The transparency of the pretty petals give them a similar sheen to tissue paper. Beautiful floral shot . . . again. You always get such great closeup shots. Such a pretty flower, so delicate looking. Wait. Cactus have flowers that are pretty? I knew they flowered, but I never imagined they could look like that. Beautiful!!! I think it's cool that a cactus flowers. I don't see much cacti, so I definitely don't see many cactus plants with flowers. Don't you love prickly cacti with delicate flowers? nice shot! I love the flowers..and taking pictures of them will always be nice :)..